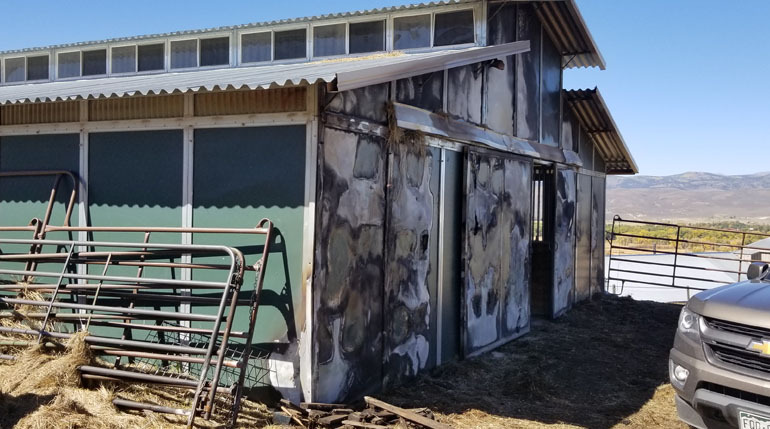 Travis Underwood’s of Gunnison Colorado barn fire testimonial. When Mr. Underwood bought his property with an existing MD Barnmaster Barn, he had no idea how lucky and beneficial that it was an MD Barnmaster brand barn. That is until after the Underwood’s experienced a raging hay bale fire. 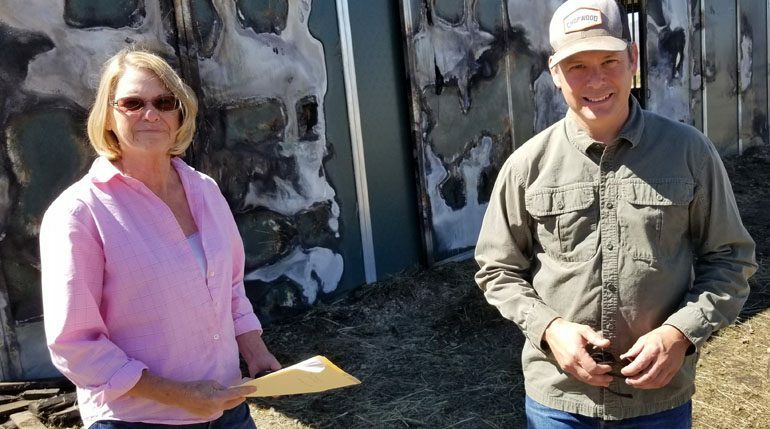 When Travis contacted MD Barnmaster, Colorado dealer Coffman Barns immediately responded by sending their sales representative Kathleen Burke to evaluate the damage. After hearing that there was an approximate 400 hay bale fire, Kathleen was amazed that the damaged was so limited. 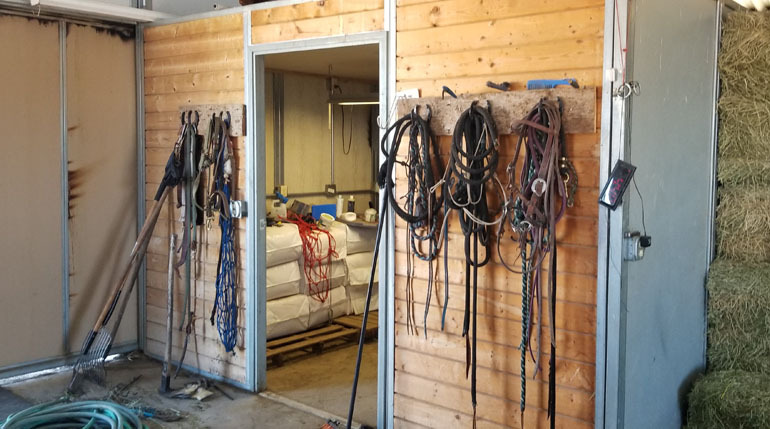 Mr. Underwood explained that he had unloaded and stacked about 300 bales just outside the barn, with about 100 bales still on the trailer, when the hay was ignited from a broken tail light. The flames quickly spread and the entire load was engulfed in flames. 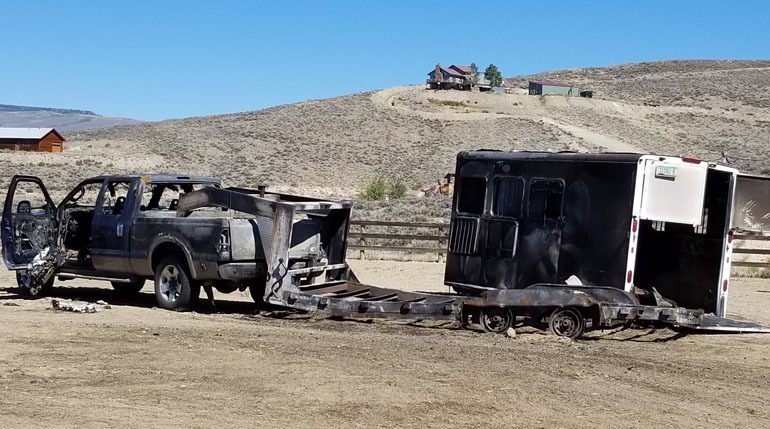 While calling the fire department the Underwood’s quickly raced to get their horses out from the other end of the the breezeway. They were relieved to find that the horses were safe and uninjured. 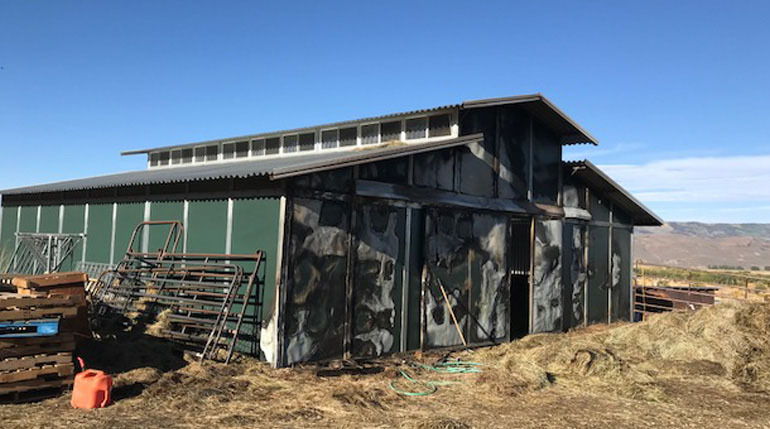 Meanwhile, the fire was right up against the outside of the barn and Underwood’s were thinking that the whole barn was going to be lost. 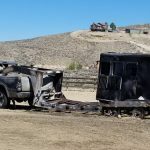 When the fire department rolled onto the scene they worked quickly to put the flames and save the barn, however the truck, the hay trailer and the horse trailer were a total loss. See pictures. 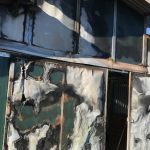 The firemen on scene commentated on how shocked they were that the barn didn’t burn down and that they were able to save it from further damage. Even more surprising is that just inside the barn there were just as many stored hay bales that did not ignite. 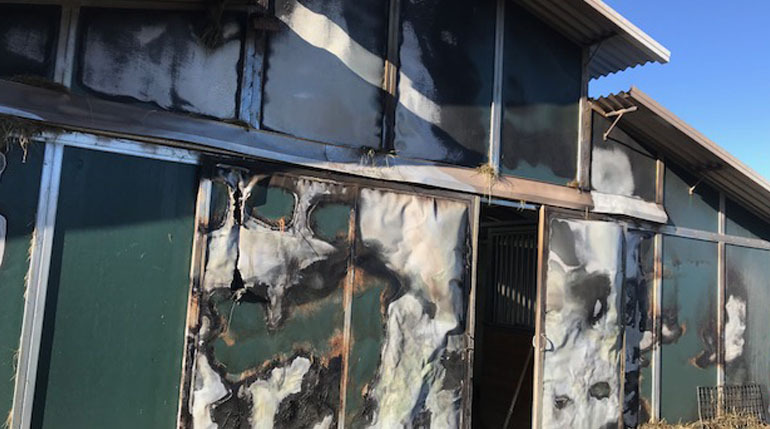 As you can see that the inside of the barn suffered only some smoke damage. 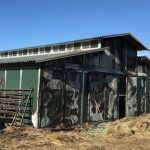 The only parts needing to be replaced are essentially the one end of the barn wall panels, gables and doors that were burnt on the outside. 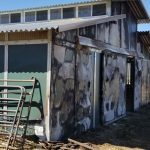 None of the roofing needs to be replaced and the Underwood’s are still able to fully use their barn while they await for insurance adjustments and manufacturing time to replace the damaged parts. 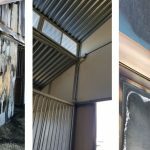 Another benefit of the modular technology of MD Barnmaster barns is the ease of replacing the damaged parts, which will be as easy as unbolting the old and bolting on the new. MDB barns can even be unassembled and moved from one property to another. MD barn master barns are built with safety in mind. 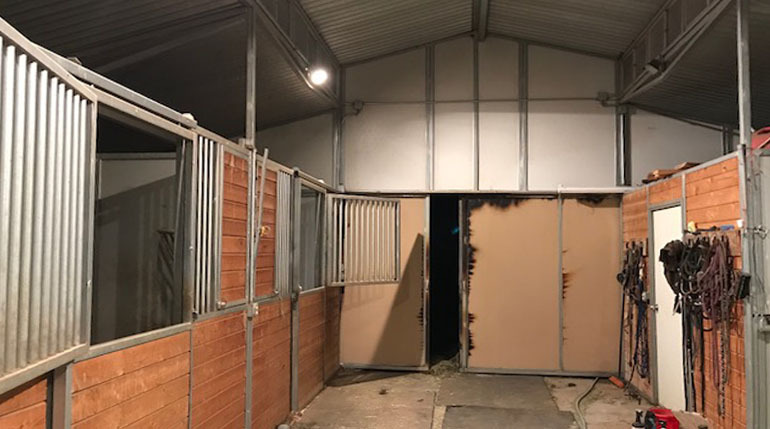 Rest easy at night knowing the near “Zero Fire Spread Rating” of MD Barnmaster’s modular wall panel system will provide the best fire protection for your horses and livestock, as well as your barn investment. 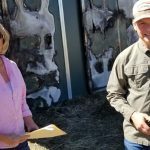 Coffman Barns, official MD Banmaster dealer in Colorado, Wyoming and Montana, would like to personally thank the Underwood’s for sharing their barn fire testimonial. 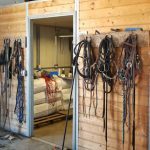 We take great pleasure in knowing that their horses are safe and that the damage to their barn was very limited. 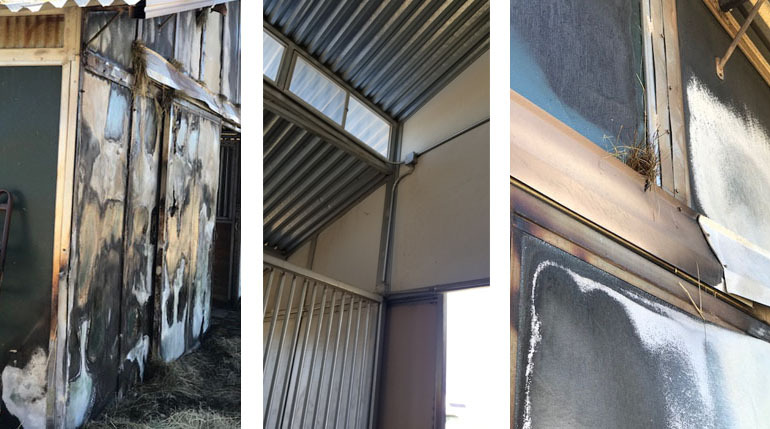 MD Barnmaster’s steel lined wall systems and metal roofing offers near zero flame spread rating. MD Barnmaster’s steel lined wall systems and feature 26ga zinc steel siding laminated over 3/4“ plywood with 26ga pre-finished painted steel wall siding at exterior. 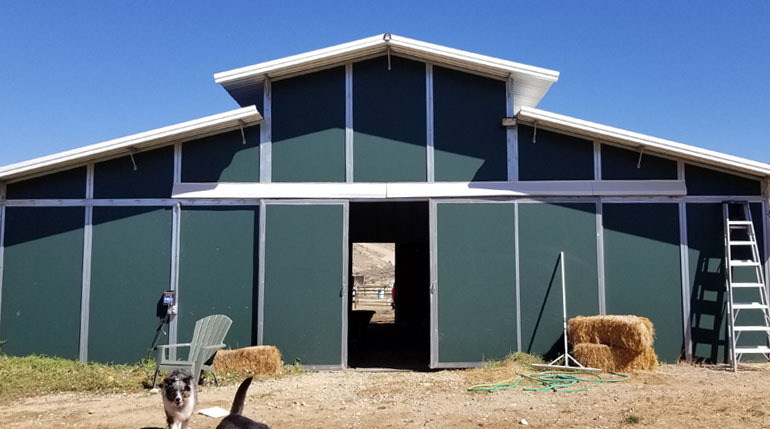 Top of the line door hardware and bridged weep hole in the bottom proprietary wall channel specifically designed by MD Barnmaster provides years of carefree use. 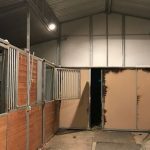 MD Barnmaster’s lifetime kick proof and chew proof warranty on their steel lined wall panels provides the confidence and safety features that your horses will not be able to kick thru the stall walls which can cause injury. 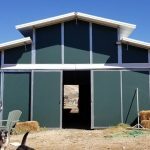 Standard MD Barnmaster barns are engineered to withstand heavy snow and high winds loads and roof structures can be custom engineered for even greater weather conditions. Since 1975, MD Barnmaster has been the leading, most recognized barn manufacturer in the world.